Chesterfield guaranteed a League Two play-off place with victory at relegation-threatened Hartlepool. The home side took the lead as Jack Barmby released Luke James who fired in with a curled left-footed effort. The Spireites equalised through Liam Cooper's tap-in and then took the lead after half-time with Eoin Doyle's exquisite lob beating Andy Rafferty. The visitors nearly grabbed a third through Armand Gnanduillet as Pools offered little resistance late on. The result deepens Hartlepool's relegation worries as they sit just three points clear of the drop zone, while Chesterfield are only two points behind leaders Scunthorpe. "Everyone's very excited because we've won a game and results have gone our way, but this league's like that. "All of a sudden now the point last week becomes not such a bad point. "Sometimes you need some people to give you a pat on the back and say 'let's keep it going'. "My job is to keep everybody calm now and get ready for next Saturday." Match ends, Hartlepool United 1, Chesterfield 2. Second Half ends, Hartlepool United 1, Chesterfield 2. Corner, Hartlepool United. Conceded by Ian Evatt. Foul by Liam Cooper (Chesterfield). Attempt saved. Armand Gnanduillet (Chesterfield) left footed shot from the centre of the box is saved in the top centre of the goal. Corner, Chesterfield. Conceded by Connor Oliver. Hand ball by Armand Gnanduillet (Chesterfield). Substitution, Chesterfield. Armand Gnanduillet replaces Marc Richards. Substitution, Hartlepool United. Connor Oliver replaces Brad Walker. Simon Walton (Hartlepool United) wins a free kick in the defensive half. Foul by Marc Richards (Chesterfield). Attempt missed. Eoin Doyle (Chesterfield) right footed shot from the centre of the box misses to the left. Attempt blocked. Scott Harrison (Hartlepool United) left footed shot from outside the box is blocked. Corner, Chesterfield. Conceded by Michael Duckworth. Sam Collins (Hartlepool United) wins a free kick in the attacking half. Attempt missed. Michael Duckworth (Hartlepool United) right footed shot from outside the box is high and wide to the left. Corner, Chesterfield. Conceded by Simon Walton. Substitution, Hartlepool United. Jonathan Franks replaces Jack Compton. Attempt missed. Ian Evatt (Chesterfield) header from the centre of the box is close, but misses to the right. Foul by Jack Compton (Hartlepool United). Substitution, Hartlepool United. James Poole replaces Jack Barmby. Substitution, Chesterfield. Ritchie Humphreys replaces Daniel Kearns. Substitution, Chesterfield. Gary Roberts replaces Dan Gardner because of an injury. Foul by Marlon Harewood (Hartlepool United). Scott Harrison (Hartlepool United) wins a free kick in the defensive half. Corner, Chesterfield. Conceded by Darren Holden. Goal! Hartlepool United 1, Chesterfield 2. 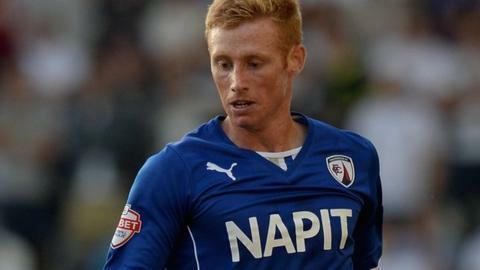 Eoin Doyle (Chesterfield) right footed shot from the right side of the box to the top left corner. Assisted by Dan Gardner. Corner, Chesterfield. Conceded by Scott Harrison. Second Half begins Hartlepool United 1, Chesterfield 1. First Half ends, Hartlepool United 1, Chesterfield 1.